LO Summer Concerts are Happening! 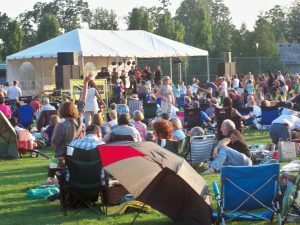 One of my very favorite events each summer is attending the free, outdoor summer concerts that the City of Lake Oswego offers in July and August. They are every Wednesday night. In July they go from 7-9 pm at Foothills Park. In August they move to Westlake Park and go from 6:30 to 8:30. They are free! I like to show up at least half and hour or even an hour early, and I bring a picnic dinner. Getting there early increases the odds that you’ll get a seat a bit close to the stage. It’s a beautiful summer evening and the picnic dining is delightful. About the time the meal is finished the band gets going. You don’t have to dance but it is honestly hard not to. The pit area up next to the stage quickly fills with adults and kids. As the sun sets it just gets better and better. I have seen so many special moments. Older couples who are obviously in love, a disabled woman with her significant other who pulled her to her feet and then gently swayed with her. The kids and the kids-at-heart just boogieing down. It’s a great, very carefree, atmosphere. July 5th has come and gone, but it featured Ty Curtis playing rhythm and blues. July 12th at Foothills Park will be Barracuda, a Heart tribute band. July 19th at Foothills Park will be Jult, a Rock and Pop band featuring music of the 80’s and 90’s. July 26th at Foothills Park will be Paul Creighton who plays the music of Steview Wonder. 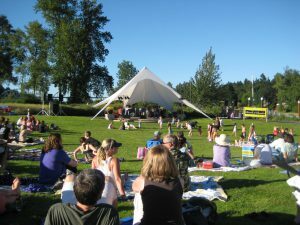 August 9th at Westlake Park will be Chris Baum who plays the music of Steely Dan. August 16th at Westlake Park will be Cloverdayle, a group that plays Country Rock. August 23rd at Westlake Park will be Kalimba, a group that pays tribute to Earth, Wind & Fire. Put a few or all of these dates onto your calendar and take advantage of the sweet summer nights. I hope to see you there!